1966-67 Senior & 67 U’21 County Champions 50th Anniversary celebrations. 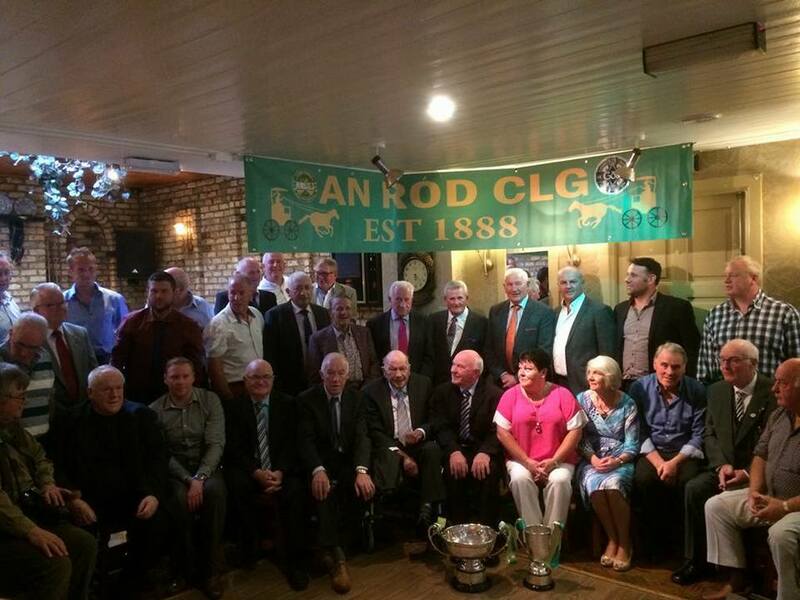 On Sunday evening last Rhode GAA members and players of the past came together to remember and celebrate the wonderful achievements of the 1966-67 Senior and U,21 Teams as they etched their way into the history books of Rhode and Offaly Football as Legends. It was a night of nostalgia for many as some met their team mates for the first time in many years having gone to live and work further afield. As you walked into Killeens’s lounge you could feel the joy of the occasion with so many wonderful characters and legends of Rhode GAA. To open Proceedings Club Chairman Joe Malone welcomed all in attendance and hoped they enjoy the celebrations. 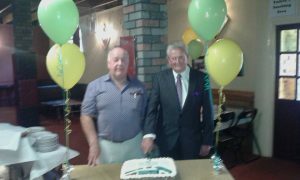 Senior Captain of the 66-67 teams Paddy McCormack and U,21 Team Captain cut the special 50th Anniversary cake on behalf of their team mates and the meal was underway. 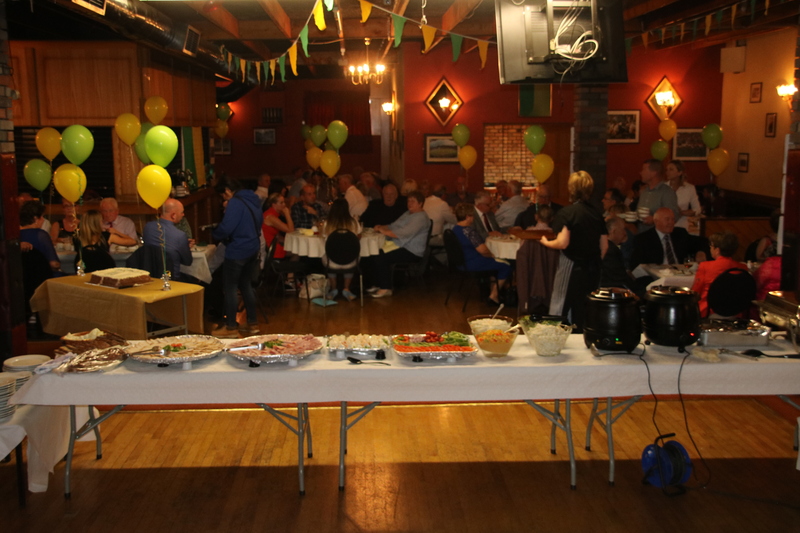 Following the meal the large contingent of past players, wife’s and representatives moved out to the Croghan Lounge where the presentation was about to take place, Getting the presentation proceedings underway was no other than John Beezy Glennon our MC for the night. One by one John called out each member of the 66-67 teams and officials speaking elegantly of those wonderful players officials and management of the three teams living and deceased. Rhode GAA Chairman Joe Malone presented them with special momento of a Club tie and medal honouring their great Achievements One man that was singled out for all the best reasons was the Great Liam Swaine who we all were delighted to see present despite his bad health and his wife Kathleen also. Two wonderful Rhode Gaels. . When receiving his momento he was given a well deserved standing ovation . Speaking on the night were Team Captain of the 66-67 Senior team and U,21 Team Captain Jody Gunning both speaking wonderfully about their fellow team-mates and achievements in them years. Also thanking the club for the wonderful night and expressing their hopes for Rhode to keep on winning. The Footballing Maestro himself the Legendary Paddy Kerrigan who over seen the winning teams as manager spoke passionately about his players and the club for giving him so many happy memories . He thanked the club for this wonderful night and wished all the very best in the years to come. Last to Speak was Club Chairman Joe Malone who spoke excellently on the past achievements of the 1966-67 teams , mentors and club officials. Joe went onto say that the achievements of those people and the Rhode teams over the last number of years should never be taking for granted and should be enjoyed. Finishing up Joe thanked Colm & Cathriona Killeen and their wonderful staff for the lovely food and service through out the evening. Also thanked Patricia McManus, Robert Kellaghan and John Glennon on the organising of the 50th anniversary celebrations. He hoped everyone had and continue to have a great night and wished them a safe journey home. Much reminiscing took place on the night with many a yarn told and a song sang. May there be many more nights to be enjoyed for the Green and Gold. A massive Thank you to Colm & Cathriona Killeen for the wonderful food and service especially by their staff. A special mention to Doreen, Kitty, Gillian and Rosemary for the wonderful food and service during the meal it was top class. To Caroline Aspell for a wonderful cake it looked lovely and was enjoyed by all. A special thanks to the Offaly Press and Photographers for attending especially Kevin Corrgian of the Tullamore Tribune. Finally a massive thank you to John Glennon and Robert Kellaghan for their hard work but most especially to Pat and Patricia McManus for their hard work with decorations and work Patricia did throughout which made a wonderful night. Rhode Senior Footballers play Tullamore in the final game of the group stages in St.Brigid’s GAA park in Croghan on this Friday September 1st at 8pm. Rhode U,12s travelled to Lake point Park in Mullingar where they took part in St.Lomans GAA annual blitz. 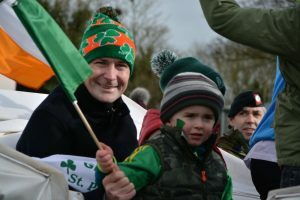 Other visiting teams were Killoe Emmet Og of Longford, Ramor Utd of Cavan, Celbridge GAA of Kildare and Moate of Westmeath. Rhode played some wonderful football through the day which got them to the final where they played Ramor Utd of Cavan and came out victorious . 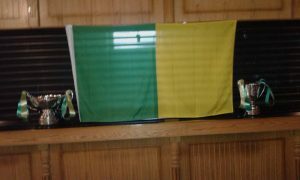 A wonderful achievement for the young lads in the green and gold. A massive thank you to St.Loman’s GAA club for the invitation and been wonderful hosts. Thanks also to the management team of Stephen Darby, Deano Cocoman, Pauric Murphy and Michael Kennedy for their continuous hard work . Rhode U,6 boys travelled to Daingean on Saturday morning last where they played Daingean’s mini maroons in two 12 aside games of football with great heart shown by the warriors and maroons.. It was a very enjoyable day for the kids who were very well behaved through out the day afterwards they were treated to SuperMacs . A big thank you to the management team of Gordan Kerrigan, Colin Kerrigan, Cathal Sword’s, Mattie Moore, Leo Troy, and Ger Noonan. for their hard work over the summer and on the day. Thanks also to Daingean GAA for doing such a wonderful job hosting the blitz. On behalf of himself and his management team Gordan would like to thank the club for providing the bus and the parents for bringing the kids training during the summer. Training will continue every Friday at 6:30 pm in the field. 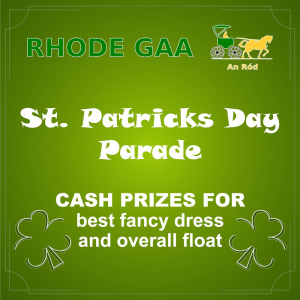 Well done to Rhode U,8s who took part in a blits in Shamrocks GAA club. Massive congratulations to great club man David Hope on defeating Kerry’s Dominick Lynch in the men’s 35 singles final to become All Ireland Champion. 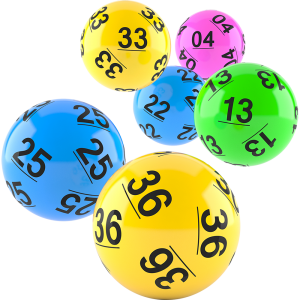 There was no winner of the Rhode GAA Lotto Draw that took place on the 21st of August for a Jackpot of €15,000. The numbers drawn were 7 16 18 22. The club would like to thank all those who supported the draw and thanks to O’Toole’s for the use of their premises and for their help and cooperation. The following matched three numbers and received €70 each. Best of luck to all either starting Primary or Secondary School or just returning . Massive congratulations to Rhode player Niall Cole and his wife Fiona on the birth of their baby girl Rebecca on Thursday last. Get Well wishes are sent to the great Patsy Murphy of Kilowen who is currently hospitalised at the moment.